Home improvement retailer Lowe's has teamed with the Boy Scouts of America to provide the Lowe's National Eagle Scout Project Impact grant for candidates working on their Eagle Scout project. A generous contribution from the Lowe's Charitable and Educational Foundation has made it possible for local councils to present selected Eagle Scout candidates with a $100 prepaid gift card to be used toward their service projects. Life Scouts who are planning a construction-based project may apply. Local councils will be notified of their allotment of awards, which will be figured based on a percentage of each council's three-year average for Eagle Scout Awards earned. The council or district Eagle project review board will determine which projects qualify for a Lowe's grant. The local council will distribute its allotment of the $100 prepaid gift cards to recipients. Cards must be used to purchase building materials and equipment for the Eagle candidate's service project. The gift card may be used at any Lowe's location or any place that it is accepted. Please use the Eagle Scout Service Project Workbook, No. 512-927 as documentation. Submit copies of pages 6 through 10 with the grant application to your local council. 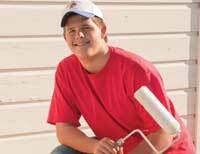 Submit any questions regarding the Lowe's National Eagle Scout Project Impact grant to lowes.grant@scouting.org. Be a registered Life Scout. Complete and submit the Lowe's grant application. Be sure the Eagle Scout service project has all approvals before the work begins. Use the Eagle Scout Service Project Workbook to document the results of the service project. Make photographs and all documentation available to the BSA for sharing with Lowe's. If you plan to spend your gift card at a Lowe's location, you should consider speaking with the local store manager when you arrive. This will help Lowe's track how well the program is being received. Document your project with "before" and "after" photographs. Be sure photographs show how the materials and equipment purchased with the gift card were used for your service project. The Boy Scouts of America thanks the Lowe's Charitable and Educational Foundation for its generous support of Scouting across the country. Through this unique program, thousands of Life Scouts who are hard at work on their Eagle Scout service project will benefit from the contribution. Communities and organizations will benefit, too. Your first concern during any project should always be safety. Wear appropriate safety gear—including safety glasses, masks, heavy gloves, and even ear protection—when needed. Learn how to use the right tools for the job. The Home Repairs merit badge pamphlet is a good resource.